We have exclusively an Early Medieval gold bracelet (or mini torc) and a stunning Anglo Saxon gold and garnet pyramid mount. 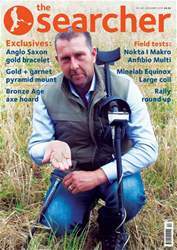 Gordon Heritage reviews the new Equinox series large coil and Sid Perry tests the new Nokta I Makro Anfibio Multi. We have reports on Detectival 2018 and the very productive Rodney Cook Memorial Charity dig too. There’s much much more in this 100 page issue!